Hartford Services offers quality AC maintenance and repair services to residents in the Houston area. Our skilled technicians use the most up-to-date methods to maintain HVAC systems and fight the Texas summer heat. Most homes have AC units connected to a forced air system which uses the same motor, blower and duct work to heat and cool the home. Hot air moves through the blower across the evaporator coil and is forced through the ducts to cool the house. These are just a few of the major components that often require repairs. Resetting the unit or replacing a blown fuse may be all that is needed to get your AC back up and running, while more complex repairs may require that several parts be replaced. No matter how simple or complex, Hartford Services will diagnose and repair your AC issues quickly and efficiently. Check out our Preferred Treatment Plan for information on how regular maintenance checkups can detect problems at their onset, preventing costly repairs and saving you money. We know how important it is to keep your home cool and your family comfortable. When you need quick, quality service, Hartford Services is the one to call. 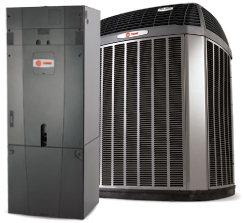 We are available year-round to keep your unit running smoothly and to service all your AC needs. Request an Appointment today!